We’d love your help. Let us know what’s wrong with this preview of Sweet September by Kathleen Bauer. Harvest at Heather Creek Farm is an exciting time, but the children don't seem to be getting into the spirit. Charolette sets out to uncover the truth. The family learns about the love that binds them together. To ask other readers questions about Sweet September, please sign up. I received a compl I also enjoyed this book, the next in the Home to Heather Creek Series. Even though a different author wrote this book, it still went well with the first book. It continues the story and struggle of Charlotte and her grandkids trying to adjust to life. All three children are still struggling to adjust to farm life and life in a rural area. The author portrayed that struggle very well. I look forward to reading more about this charming family in upcoming releases in this series. Very nice story. Slow paced and comfortable. I'm glad to see the kids already coming to terms with their situation in this second book of the series. It's also very nice that the family bonded over helping someone in need. I was a little concerned that in this day and age there wasn't some mention of checking into his background before recommending him for employment. However, it is refreshing to show people looking for the good in others and for second chances. Challenges: RRRCs February 2019 - Colorful cover/beautiful scene (parrot) (2); also, Create Your Own Readathon/Stacking the Series 2019/Steeped in books - Tertiary List/Level 6/Book 2. Continuing challenges of Charlotte and Bob Stevenson raising their grandchildren. Several poignant events (the mocha coffee, the carburetor, and Jefferson) stir the heart and quench the soul as the story deepens in family history and widens in the embrace of community. Good wholesome read. Good reminder to help those around us and to lead a life of service. Much better than the first book in the series. Granted that it's still modern fiction and a "light" read (I don't need my dictionary), it is a better work than most modern fiction. Now that school has picked up again for Sam, Emily and Christopher, some things are changing more than just grade levels and teachers for the Slater children. It's been a rough time not only coming to terms with the death of their mother, but relocating from busy San Diego, to a country farm in Nebraska along Heather Creek to live with their grandparents Charlotte and Bob. For Sam, he doesn't see the sense in trying to memorize geometry facts along with history names and dates. What's worse is t Now that school has picked up again for Sam, Emily and Christopher, some things are changing more than just grade levels and teachers for the Slater children. It's been a rough time not only coming to terms with the death of their mother, but relocating from busy San Diego, to a country farm in Nebraska along Heather Creek to live with their grandparents Charlotte and Bob. For Sam, he doesn't see the sense in trying to memorize geometry facts along with history names and dates. What's worse is that it's beginning to take its toll on his grades and if his teacher can't convince him, perhaps his grandparents are willing to listen. Emily is still trying to fit in without the lack of technology she had grown accustom to, it is now non exist on the small farm. What's worse is that her friends from San Diego have apparently moved on without her and there isn't a decent place to shop for clothes in town. Her only hope is the one friend she has managed to make with Ashley, a girl who has befriended her at school but also introduced her to youth group at church as well. Sure beats hanging out on the farm. Christopher, the youngest has managed to keep all his deep secrets hidden along with the occasional treasures he finds during his outings with the family dog, Toby. He wonders if finding a way to invent a time machine might just be the answer they all need to go back to before his mom died. Perhaps they would all be a whole lot happier. Charlotte knew that it would take time for the grandchildren to fit in but last thing she expected to hear while Ashley spent the night was a conversation between Emily and herself.
" I don't know why anyone would want to stay in Nebraska forever. There is no ocean, no mountains, not to mention all the potholes and no place to shop. As soon as I'm old enough, I'm out of here, just like Sam. Nothing here worth keeping me around." What would it take for all these issues to be resolved and for her family to find peace amongst one another? Will it take the loss of Bob's health to drive them to put others before their own needs? Will more sacrifices need to be made in order for the family to come together or will another tragedy drive them all apart once and for all? In the novel Sweet September written under the pen name of Kathleen Bauer, by a team of writers who have come together to create the series Home to Heather Creek. Tricia Goyer takes the helm as she takes us back to the lives of the Slater children whom we read about in Before the Dawn. In this novel however, the children have had some time to adapt to life on the farm, and even though Charlotte had hoped things would work out, it appears that there is more going on than meets the eye. Even her vegetable crop is mysteriously vanishing which means that there will be even less of a harvest to meet the needs of her growing family. Will the family find a way to work together to see that despite tough times, love really does conquer all? You'll have to pick this one up to find out, but well worth the time. Bob hunkered down and scooped up a handful of soil, allowing it to filter through his fingers. He stared intently at the dirt as if reading a story in each speck. "One day, my grandma, your great-great-grandma, heard a knock at the door," he began. "It was a man whose car had broken down. The man had a woman and a baby with him—all were painfully thin. The man didn't ask for much. In fact, he only asked for one thing." "What was that?" Christopher asked. "A job. A place to live?" "No, son. He only asked if they could spare food for his sick baby." "Land's sakes. I couldn't imagine." Charlotte clutched her arms to her. An aching filled her gut as she tried to imagine being in such a spot. "My family—our family—took in this hungry couple. We fed them. Our family didn't have much, but they had enough to share." "Did the baby get better?" Christopher cradled the carburetor as if clinging to the infant himself. Bob sighed. "Unfortunately not. He never gained his strength back and died on the farm. Eventually Grandpa William and Great-Grandma Betty helped the couple get a new part for their car. They threw the old one on the farm's dump and the sad family went on their way. They never heard from them again. But that sick baby, and that desperate family, so touched my great-grandparents, they vowed from that day on to make Heather Creek Farm a place of refuge for all that needed help." "Refuge?" Christopher scratched his head near the blonde cowlick that always stuck up no matter how many times he combed it. "A place of safety. Where you go to be cared for and looked after," Charlotte answered. It's finally harvest time on the farm. A time for hard work to reap the benefits of this year's planting. Harvest time at Heather Creek Farm this year has it's obstacles. Worn equipment and the challenges the children are facing after their mother's death make things more difficult. Emily finds living on the farm a challenge. She misses her friends and wants to go back to California, Sam is failing in school and doesn't seem to care, and Christopher is always keeping to himself. It seems the barn cats are his best friends. Charlotte isn't sure how to get through to the three of them and feels her stress mounting daily. Add to that the fact that someone is stealing food from her garden and that means less food for the table. But God uses a total stranger to open their eyes and make them realize they are truly blessed. I fall in love with this family a little more with each book. Their continuing story draws me in and I just want to keep reading. Charlotte is at her wits end and her stress level is high. She doesn't want to make the same mistakes with her grandkids as she did with her own kids so she is always second guessing herself with each decision. But I loved the way God helped her release her stress by allowing her to help someone in dire need. One man changed the entire family's outlook on their own lives and that in itself is a true miracle. Grace flowing like a river. Sam, Emily and Christopher, with God's help, pick themselves up and begin their lives anew. You will adore the Stevenson family and want to read more. Their family is a family of strong faith and Charlotte and Bob are doing their best to pass this faith on to their grandkids. And, since I am a romance junkie, I am excited to say that I sense a little spark of romance in future books. If you love sweet, wholesome stories you'll enjoy Sweet September. Kathleen Bauer in her new book “Sweet September” Book Two in the Home To Heather Creek series published by Guideposts takes us into the life of Charlotte Stevenson. From the back cover: As tenuous family bonds threaten to break apart, a mystery on the farm might be the one thing that can restore the Stevensons’ hope for the harvest. Harvest at Heather Creek Farm is an exciting time, the earth bursts with life, providing sustenance for the coming winter. However, the Slater children don’t seem to b Kathleen Bauer in her new book “Sweet September” Book Two in the Home To Heather Creek series published by Guideposts takes us into the life of Charlotte Stevenson. Harvest at Heather Creek Farm is an exciting time, the earth bursts with life, providing sustenance for the coming winter. However, the Slater children don’t seem to be getting into the spirit: Emily is struggling with farm life, Christopher spends most of his time alone, and Sam is failing school. Charlotte is determined not to make the same mistakes she did with her own kids, but how can she get her grandchildren back on track? Then the vegetable garden by the house is uprooted one night. Who could have done such a thing? Charlotte is determined to uncover the truth, and as they all pull together to find answers, they learn more about one another and the love that binds them. As this cobbled-together family adjusts to their new life, they find hope for the future in the lessons of their past. Come Home to Heather Creek: Get to know Charlotte Stevenson, who is raising her grandchildren on the family farm after a tragic accident changes all of their lives forever. With the help of her husband Bob and a close-knit circle of friends, she will do whatever it takes to keep this fragile family together. See how God, who makes the sun rise and the crops grow, watches over our lives too. There is no yellow “Families For Dummies” book available out there. Each family has to learn how to deal with each member of that family day by day, sometimes minute by minute. This is what happens to Charlotte, her husband Bob, their son Pete who suddenly found themselves grandparents and an uncle to three children. The children, Emily, Christopher and Sam, are trying to deal with life on a farm, grandparents and an uncle. For all of them there is quite a lot to adjust to. ”Sweet September” is a lot of fun and filled with great characters that you want to hang out with. Tricia Goyer, writing under the pen name of Kathleen Bauer, has given us a wonderful, sweet story with power and depth that will keep you flipping pages. I am looking forward to more in this series. Here is the sequel to Before the Dawn where readers were first introduced to a unique family and changes happening all the time on the farm. As the characters from book one continue on here, readers will begin to appreciate even more the reality of life as portrayed in the work of fiction. In a time when being grandparents and enjoying their retiring years is looked forward to instead turns into becoming guardians of their daughter’s three growing children. The story of Before the Dawn where we see the changes from city life to small town life can be very hard. Add to that moving in with grandparents they hardly knew, beginning at new schools, making new friends all combines in learning to depend on the Lord to make them into a close family in more than name only. In Sweet September, the grandfather, Bob, is struggling with all the changes coming into the farming profession plus learning what he can’t do. Christopher, being the youngest, seems most capable of drawing out of his grandpa the history of the area, farm and family when he happens to dig up a piece of something hidden under the dirt for a long time. Sam, the oldest of the three kids, must decide whether to take school seriously and thrive or face the consequences that failing a class will bring. Since I don’t want to ruin the story by revealing too much of it, let me say that here is another example of great faith-filled fiction. The reason is because faith is not represented as an instant fix to problems, but points the characters to the God who can do above anything we ask or think. As time goes on in the story, we see how prayers for the uniting of hearts come about as each person learns who they are and Who God is. Whether sitting together at meal times, having reading times or talking with friends over coffee, the love of others permeates the pages. There is also portrayed a character who is challenging to understand as she seems to put on airs around others. Another part of the novel shows how time is an aspect that changes the family from being strangers, then to struggling with grief to the change to loving their family history and how the farm came with a responsibility. Family history, state history or other types of history have a way of pulling people out from being focused on themselves to being servants of whomever God brings across our path. The grandmother in the story learned too that God has to do the work with hardest part being to not get in His way. I hope you consider reading the series and sharing the novels with others for them to appreciate as well. From Guideposts comes a series of books that brings its readers into the middle of a hurting family as they learn to live together. We're introduced to Charlotte and Bob, whose basically empty nester life is shaken up when they become the primary caregivers to three grandchildren that they have never really known after the death of their daughter, Denise. In the first of the books, Before The Dawn, Sam (16), Emily (14), and Christopher (9), arrive at their grandparents' Nebraska farm - a hige ch From Guideposts comes a series of books that brings its readers into the middle of a hurting family as they learn to live together. We're introduced to Charlotte and Bob, whose basically empty nester life is shaken up when they become the primary caregivers to three grandchildren that they have never really known after the death of their daughter, Denise. In the first of the books, Before The Dawn, Sam (16), Emily (14), and Christopher (9), arrive at their grandparents' Nebraska farm - a hige change from their life in California. Still reeling from the sudden and unexpected death of their mom, the kids struggle through grief, settling into life on a farm, and getting to know their grandparents. Despite the fact that this story is full of pain and sorrow, it's the kind of story that you can easily fall into, immediately empathizing with the characters. Everything they feel is raw and real. I love Charlotte - the grandma who wonders how to raise children in this new generation, grieving the loss of both her daughter and their broken relationship that will never be repaired now, and trying to balance the life of "mom" again with her responsibilities as a farm wife. 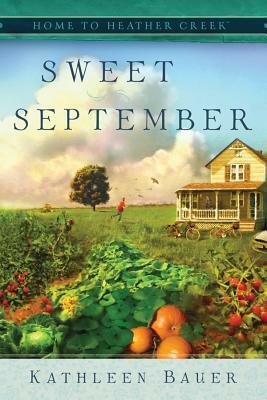 The second book, Sweet September, brings us back to the farm in the fall - as harvest hits and a new school year begins. Sam, Emily, and Christopher have settled into their new life on the farm, and are all working to build together a family. However, someone or something is stealing things from their garden - and no one can figure out who or what is taking all their vegetables! Interspersed amongst the mystery of solving who is raiding their hard work, life continues. Again, Charlotte's realistic struggles to keep the family and home together are real and understandable. Watching her husband, Bob - a lifelong farmer who is struggling with the realization that he's no longer a young man who can run the farm - through Charlotte's eyes, you can feel the love and the conflict of emotions that she goes through. My only complaint about this book is that there was an underlying belittling of Charlotte and Bob's son, Pete - who lives in an apartment on the farm and has taken over the duties as farmer. Repeatedly, Charlotte mentally tears down her son for never having finished school, or for not having done anything with himself. He quit school because he was passionate about farming. You would think that they would be thankful for their son's passion for farming, since he has been running the farm that provides for their family's finances! Amazingly, these two books were written by two different authors under a single pen name. I wasn't sure how that would work - but I didn't even notice a difference in writing style or tone when switching between the two stories! Well done. I really enjoyed book that are in a series. The Home to Heather Creek Series is no exception! I truly enjoyed this these two books! The story starts out with a tragic event. Sam, Emily and Christopher loose their mother in a motor vehicle accident. They are taken from their home in San Diego into the heart of Nebraska to live on a farm with their grandparents with whom they barely know, Charlotte and Bob and their Uncle Pete their mother Denise’s brother who lives on the farm with his parents an I really enjoyed book that are in a series. The Home to Heather Creek Series is no exception! I truly enjoyed this these two books! The story starts out with a tragic event. Sam, Emily and Christopher loose their mother in a motor vehicle accident. They are taken from their home in San Diego into the heart of Nebraska to live on a farm with their grandparents with whom they barely know, Charlotte and Bob and their Uncle Pete their mother Denise’s brother who lives on the farm with his parents and helps run the family farm. The children go from their busy lives with cell phones and computers and a more city culture to rural farm living in a small town. Quite a lot of change for these three. It is also quite a change for Charlotte and Bob who are sort of set in their ways and feel there is only one way to rear children. Their way. The way they raised their own children. However both Charlotte and Bob learn that maybe the way they raise their grandchildren should be a bit different than the way they raised their own children. You can feel the heartache and changes the children feel being plucked from the life they knew to this totally new and alien feeling life they are suddenly thrust into. I felt sad for these kids. I felt sad for Charlotte and Bob doing the best they knew how to help the children through their loss while also working through the loss of their daughter. How difficult that would be! I felt that in Before the Dawn that the Bob’s character did not play as much of a leading role as Charlotte. While Bob was in the storyline I did feel that he was sort of on the back burner and he did not seem to interact with the children the way Charlotte did. I did not feel we got to see much of him and get to know his character as we did Charlotte. Charlotte, Pete and the children played more of a major role in the first book. However in Sweet September, I felt that Bob’s character was much more prominent and part of the storyline. The children have adjusted more to farm life and have made some friends at the local school and feel a part of the farm and the family! There is even a mystery involved in this story! Both of these books were light reads with a wonderful message about love, hard work and forgiveness and mending brokenness. That from a horrible loss love can bloom and life can go on and we can remember our loved ones while creating new memories. I truly enjoyed these books and I hope that there will be another in this series! What can be more traumatic for a child than losing mother to a senseless accident? They have no other choice than to move in with their grandparent on a farm out in the middle of nowhere land. For city kids, in their opinion, this is not a good move. Since they have an absentee father what else could they do. They do not really even know their grandparents since their mother had been estranged from her parents except for an occasional phone call. Two moody and pouting teens, the oldest a man/boy What can be more traumatic for a child than losing mother to a senseless accident? They have no other choice than to move in with their grandparent on a farm out in the middle of nowhere land. For city kids, in their opinion, this is not a good move. Since they have an absentee father what else could they do. They do not really even know their grandparents since their mother had been estranged from her parents except for an occasional phone call. Two moody and pouting teens, the oldest a man/boy whom keeps to himself and a girl that hates the world and everything in it. Then there is a much young boy that looks to his older siblings as to how he is suppose to react to his new life on a farm. But they are not the only ones trying to cope with their grief, their grandparents and uncle are also grieving while trying not to let the kids see how difficult all of these changes are effecting their own daily lives. Routines are what the grandfather thinks will be best for them, though their grandmother would prefer to take it easy on the kids until they have been able to adjust to their new school and surroundings. She fears making the same mistake with her grandkids as she did with their mother. Everyone in town has advice, prayers and condolences with good intentions for the kids and grandparents. Some are helpful, others just create more problems. In book two, as the family gets into their daily routines something or someone starts destroying the garden they worked on so hard. The kids and their uncle come up with some hair brain ideas solve the mystery of the missing vegetables. All becomes clear when a perfect stranger visits the farm and turns out to be a true blessing to the whole family. Its seems God has some very special plans for this family as their hearts open and begin to heal. I rated both books 5 out of 5. Disclosure: I received a free copy of both books from Guideposts and Litfuse Publicity Group for review. I was in no way compensated for this review. As tenuous family bonds threaten to break apart, a mystery on the farm might be the one thing that can restore the Stevensons' hope for the harvest. Harvest at Heather Creek Farm is an exciting time, but the children don't seem to be getting into the spirit. Emily is struggling with farm life, Christopher spends most of his time alone, and Sam is failing school. Charlotte is determined not to make the same mistakes she did with her own kids, but how can she get her grandchildren back on track? Mea As tenuous family bonds threaten to break apart, a mystery on the farm might be the one thing that can restore the Stevensons' hope for the harvest. Meanwhile, the vegetable garden is uprooted one night. Who could have done such a thing? Charlotte sets out to uncover the truth, and as the kids pull together to find answers, this cobbled-together family learns more about one another and the love that binds them together. About the Home to Heather Creek series: Sweet September is the second book in the Home to Heather Creek series. Charlotte Stevenson is raising her grandchildren on the family farm after a tragic accident changes all of their lives forever. With the help of her husband Bob and a close-knit circle of friends, she will do whatever it takes to keep this fragile family together. See how God, who makes the sun rise and the crops grow, watches over our lives too. It is harvest time at Heather Creek, and the delicate relationship between the Stevenson's and the grandchildren are either going to get stronger or be broken. In the midst of all this, the garden is uprooted and it is looking more and more like it was done by human hands. The family deals with all that is happening all in their own way, and they learn what it means to be a family - even though it may not be the conventional, traditional idea of family we are all used to. The story is seamless despite the different authors writing under a singular pen name, and I would recommend these stories to anyone of any age. They are wholesome, enriching, and edifying in the best sense of the words. This is a tender story that will stay with you forever. About The Book: Harvest time at Heather Creek Farm is an exciting time, but the kids don’t seem to be getting into the spirit. One day while he’s wandering through the fields, Christopher stumbles across an old piece of metal buried in the ground. He doesn’t know what it is, but he hides it in the shed. That night, the garden by the house is uprooted. Who could have done such a thing? Charlotte is determined to find out, but is distracted when she gets news that Sam is failing school. The sullen About The Book: Harvest time at Heather Creek Farm is an exciting time, but the kids don’t seem to be getting into the spirit. One day while he’s wandering through the fields, Christopher stumbles across an old piece of metal buried in the ground. He doesn’t know what it is, but he hides it in the shed. That night, the garden by the house is uprooted. Who could have done such a thing? Charlotte is determined to find out, but is distracted when she gets news that Sam is failing school. The sullen teen is indifferent and won’t study. He starts spending a lot of time with Pete. Though she loves her son dearly, Pete never finished high school, and Charlotte is afraid he’ll encourage Sam to do the same. How can she help him get back on track? A gripping story that examines the Stevenson family’s history as well as its shaky future, Sweet September will bring you deeper into the loving community of Bedford and the deep ties of love that bind this broken family together. As they forge new connections, you’ll be entertained, inspired, and reminded that God’s grace can make all things new. My Thoughts On The Book/Series: I am huge fan of Tricia Goyer. She is a master wordsmith and delightful at character development. At the end of Before the Dawn we saw some break throughs happening in the relationships between Bob, Charlotte, Pete and Sam, Emily and Christopher. In this sequel the work takes one step forward and two steps back. I felt as if I was on the farm with the family. The characters were real and I felt as if I had made some new friends. I have always been a sucker for a family-on-a-farm story, and this was one of the best ones I've read.Thank you so much Litfuse for my copy! STATEMENT OF DISCLOSURE: I received an paperback copy of this title from Litfuse and Guidepost as part of their blogger review program . I am disclosing this in accordance with the FTC 16 CFR, Part 255 'Guides concerning the use of endorsements and testimonials in advertising. I was not asked to write a positive review and all opinions expressed are entirely my own. Thanks guys for letting me read this and participate! Sweet September picks up during harvest time. Tension runs high as Bob and Charlotte learn to give over some of the control of the farm to their older son, Pete. It doesn’t make it any easier that they’re still struggling to make a new life with their three grandchildren that came to live with them following the death of their mother. Life for Emily, Sam and Christopher is also still in turmoil as they learn to fit in with new peers, a new school and also as they learn their place on their grand Sweet September picks up during harvest time. Life for Emily, Sam and Christopher is also still in turmoil as they learn to fit in with new peers, a new school and also as they learn their place on their grandparents farm. These were fantastic books. I felt a certain sweet nostalgia reading about Charlotte. It made me miss my own grandmother that has gone on to be with the Lord. As I read this book I longed for another afternoon eating pie on a cool harvest day with my grandma and I could nearly imagine the smell of apple pie baking in the oven or the smell of cocoa waiting on the stove after a brisk walk in the fall air. If you’re looking for a quick read to prepare you for the fall season—these are two books you should pick up! I am glad I received both books at once! Kathleen Bauer is the pen name of several authors who will be writing this series. The continuance and adjustments flow so smoothly between authors. In book two, Sweet September, school is beginning and Sam, Emily, and Christopher risk reaching out and become part of their school and church activities. At home they have begun to feel a part too, as they begin chores and "early to bed and early to rise." Big breakfasts and school buses, they begin to become family. The wind picked up, carrying a scent of sunshine and prairie grass. It whipped her hair into her face and pressed against her back as if urging her forward. She'd often carried her babies to the creek's banks for a breath of fresh air. Bill had taken his first steps trying to catch a bird that had hopped along the shoreline. Denise had taken off swimming like a fish in the creek's fresh waters when she was only three. And Pete had been the one who'd always come home with a water snake, frog, or even a fish he'd found in the shallows. The path moved through the trees, then the clearing opened and the creek made a lazy loop. It flowed south, heading off into the distance. But for a moment, the bluish green water was here, and it was theirs. I am looking forward to the next books in the series. Home to Heather Creek becomes a reality as lives are touched and love blooms. Times to take a breath of fresh air and realize life continued, offering peace and joy along the banks of their creek, and Heather Creek Farm. From generation to generation, the Lord extended His peace to them. In the second book of the Home To Heather Creek series, Sweet September, the Stevenson family drama continues at their farm in Nebraska during the fall harvest. Sam, Emily, and Christopher have settled into their new lives at the farm, and the building of the family bond with their grandparents Charlotte and Bob are starting to gel as life continues on the farm. But a mystery abounds at the farm when the family discovers that someone or something has been stealing the vegetables from their garde In the second book of the Home To Heather Creek series, Sweet September, the Stevenson family drama continues at their farm in Nebraska during the fall harvest. Sam, Emily, and Christopher have settled into their new lives at the farm, and the building of the family bond with their grandparents Charlotte and Bob are starting to gel as life continues on the farm. But a mystery abounds at the farm when the family discovers that someone or something has been stealing the vegetables from their garden. Charlotte struggles to maintain the balance of responsibilities with the family, home, and farm, especially since Bob who is in his sixties, is struggling to keep up with daily responsibilities of running a farm. The emotions run high as she struggles to accept their son Pete's taking over the duties of the running the farm. Pete's passion for farming has been a source of tension, as Charlotte was disappointed that left college to pursue farming. Through the various trials and tribulations, the Stevenson family learns that the bonds of love and family will bring their broken family together again. Just like in the first book of the series, Before The Dawn, Sweet September is an inspirational story that will tug at your heartstrings. This is a wonderful inter-generational family story that will resonate with you for a long time. Disclaimer: I received a copy of the books from the author / publisher in exchange for my honest review and participation in a virtual book tour event hosted by Litfuse Publicity. I really enjoyed the first book in the Home to Heather Creek series Before the Dawn so I was excited to be able to pick right up with Sweet September after finishing. I always like getting into the second book in a series because I already know the characters and the backstory and feel like now I can really get to the heart of things! What’s different about this series from most is that it has the same main characters. It seems like usually series have different starring characters in the second I really enjoyed the first book in the Home to Heather Creek series Before the Dawn so I was excited to be able to pick right up with Sweet September after finishing. I always like getting into the second book in a series because I already know the characters and the backstory and feel like now I can really get to the heart of things! What’s different about this series from most is that it has the same main characters. It seems like usually series have different starring characters in the second book that were briefly introduced in the first. I definitely prefer this way of writing since I’m already invested in the characters and want to know more and hear more about them. Unfortunately I was a bit disappointed in this book. It basically felt like it was just a continuation of the first without much of a new plot to add or further character development. I still liked reading about how Charlotte is fairing raising her grandkids and how each of them is doing. I just expected a bit more. I was excited to read there was a mystery in this one but even that was a bit less than I expected. A few months ago, I had the pleasure of reviewing the Postcards From Misty Harbor Inn Series – a unique series of books from the Books and Inspirational Media Division of Guideposts that was written by a collaboration of best-selling authors to inspire you in your faith and to celebrate God’s love in every aspect of your life. Now, I’m excited to share that Guideposts has released another heartwarming series – the Home To Heather Creek Series – featuring a different group of best-selling authors A few months ago, I had the pleasure of reviewing the Postcards From Misty Harbor Inn Series – a unique series of books from the Books and Inspirational Media Division of Guideposts that was written by a collaboration of best-selling authors to inspire you in your faith and to celebrate God’s love in every aspect of your life. Now, I’m excited to share that Guideposts has released another heartwarming series – the Home To Heather Creek Series – featuring a different group of best-selling authors writing under the pseudonym Kathleen Bauer, and this series is just as good! If you like multi-generational stories that tug at your heartstrings and truly allow you to get involved in the lives of the characters, you will love this series! According to Guideposts, they are planning to release a total of 24 books in this series! Sweet September - written by Tricia Goyer under the pen name Kathleen Bauer - is the first book in the series. Sweet September… This book continues the Stevenson’s story, with their grandchildren living with them after their mom’s death. The kids continue to struggle getting use to live on a farm, compared with life in the big city, with their new school, and just all of the surroundings. Charlotte struggles even more to try and reach out to her grandchildren. It finally took an interesting mystery to peak interest for the entire family, bringing them together in ways they didn’t expect. And again, it wa Sweet September… This book continues the Stevenson’s story, with their grandchildren living with them after their mom’s death. The kids continue to struggle getting use to live on a farm, compared with life in the big city, with their new school, and just all of the surroundings. Charlotte struggles even more to try and reach out to her grandchildren. It finally took an interesting mystery to peak interest for the entire family, bringing them together in ways they didn’t expect. And again, it was so heartwarming to see the family come together in love and acceptance. And for grandma and grandaddy, it was heartwarming to see them recognize a part of their daughter in each of the children. Another wonderful installment into the Home to Heather Creek Series from Guidepost that you sure don’t want to miss. I loved the second book in this series. Charlotte and Ben Stevenson are adjusting to having their Golden Years now filled with children again. Big change in all of their lives. School has now begun again and the children, Sam, Emily and Christopher are beginning to fit it, although with some problems. They miss their Mom, and don't want to forget her. Love the faith based life God has placed them in. When they think things are going bad, or they are in trouble, I see Grace being show to these swe I loved the second book in this series. Charlotte and Ben Stevenson are adjusting to having their Golden Years now filled with children again. Big change in all of their lives. School has now begun again and the children, Sam, Emily and Christopher are beginning to fit it, although with some problems. They miss their Mom, and don't want to forget her. Love the faith based life God has placed them in. When they think things are going bad, or they are in trouble, I see Grace being show to these sweet kids. In this book someone or something is stealing from the family, when they need all the food, they have with the extra mouths. You will be surprised at what is taking eggs and veggie! Also how more Grace is shown. Enjoy this second book in this series, I really would love some more of this story. Harvest at Heather Creek Farm is an exciting time, but the children don't seem to be getting into the spirit. Charlotte sets out to uncover the truth. The family learns about the love that binds them together. With Harvest season knocking on their front door, Charlotte tries to get her grandchildren in the mood for working in the garden. Who ever said that would be easy? Because it's not, Sam wants to run around after his Uncle and see what he's doing, even though he knows his grades are suffering. Emily who would rather talk to her friend Ashley than work. And Christopher who has a secret he's keeping from everyone. Will Charlotte be able to pull everyone together till harvest is ended? Or will the whole thing be a bust? When Charlotte's son's old girlfriend shows up again, will it bring old feelings back? The Home to Heather Creek Series is such a delightful read. I was swept away to the farm and all the trials and joys that came from it. Both books were so well written that I felt like I was right there. I have wanted to live on a farm for a long time and I loved being swept away in to the setting. Not only was the setting enjoyable but the lessons learned and watching the Lord worked was such refreshment to the soul. The lesson of learning to let others help you was especially timely for me as The Home to Heather Creek Series is such a delightful read. I was swept away to the farm and all the trials and joys that came from it. Both books were so well written that I felt like I was right there. I have wanted to live on a farm for a long time and I loved being swept away in to the setting. Not only was the setting enjoyable but the lessons learned and watching the Lord worked was such refreshment to the soul. The lesson of learning to let others help you was especially timely for me as I am laid up and need a lot of help right now. I highly recommend this series and can't wait for more to come out. Book #2 in Guideposts "Home to Heather Creek" series. A female friend of Pete from the past is back in town. Christopher finds a treasure and Grandma knows he's up to something though she knows not what. Charlotte's grandchildren are missing the mountains, the ocean, and malls. Their words hurt. Such touching moments in this series. Listening instead of lecturing. That brought a whole new outcome to a painful situation. Taking time out of an extremely busy life to take a walk and in so doing, com Book #2 in Guideposts "Home to Heather Creek" series. Taking time out of an extremely busy life to take a walk and in so doing, come to understand new things about a "new" life. "Home To Heather Creek" promises to be a wonderful series, centering around family values and morals - something that is so needed today. Readers, both young and old, will enjoy the two first books in this series. In fact, they would make great book club selections for multi-generational groups as there is a little something for every age represented here. I enjoyed the first two books very much and look forward to more stories about the Stevenson family to come. I won this book from Goodreads, and even though I hadn't read book 1 in the series, I found it easy to follow and very much enjoyed it. I smiled at some of the scenes and was brought to tears at others. We all have struggles and if we trust God, as this family does, we will get through them. I would recommend this as an enjoyable book. So thankful I won. I won this book from goodreads. I truly enjoyed reading this story. It gives great insight into the difference of life in the city and life in the country can differ. I think if we could try to live a more self reliant lifestyle we could all be happier. I would recommend this story to anyone trying to raise children in our hectic world. Kathleen Bauer is the pen name for a team of writers who have come together to create the Home to Heather Creek series.